It’s been three days that I’m struggling with concepts of content, form, representation and so on.. 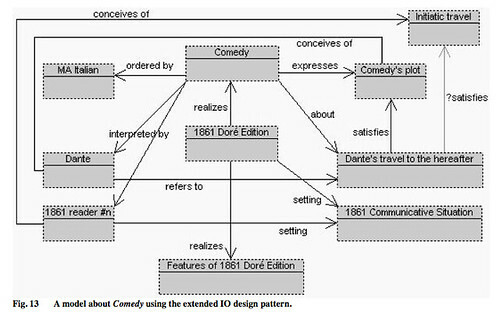 I wonder whether there’s a well-formalized theory of representations out there.. the one in DOLCE is a useful design pattern, but I’m still reluctant to say that it is complete (I hope I’ll find out to be wrong). Another clever view of the issue can be found in a tutorial by Richiiro Mizoguchi, and this is what this post is about. In this tutorial Mizoguchi talks about representation – represented-thing – representational-form etc.. No mention of information-objects, which are instead (only as a term, maybe) always present everywhere else (Dolce, Cidoc, Cyc). So what’s the proper mapping? Is an IO a representation? Moreover, I am trying to put also another model in the picture, FRBR. This bibliographic standard focuses around concepts such as work, expression and manifestation, mainly. So how do these come into the game? Sometimes I end up in some sort of ontological relativism. Since the objects we study are essentially multidimensional, and since we humans can only rationally perceive a portion of such dimensions at a given time, it follows that whatever perspective we decide to take on our objects of investigation, it will be fundamentally arbitrary and partial. In other words, there is no chance of having a single unifying perspective on reality, one which can contain all the others. No chance. So every representation gives you one side of the story only – which can be related to other sides, but never in its entirety. The theory of Mizoguchi, as I said, it’s quite different. Here’s an interesting excerpt from the article Mizoguchi, R. (2004). Tutorial on ontological engineering – Part 3: Advanced course of ontological engineering. New Generation Computing, 22(2), 198–220. A representation is composed of two parts, form and content. where p/o stands for part-of relation/slot, “form” slot name and “: Representation” is a class constraint the slot value has to satisfy. Its identity is inherited from the form which is usually what people sense its existence. On the other hand, the content is the hidden part and it is a proposition which the author of the representation would like to convey through the representation. It is critical to distinguish among proposition(content), representation and form of representation. In fact, although a novel is written in terms of sentences, novel is not a subclass of representation. 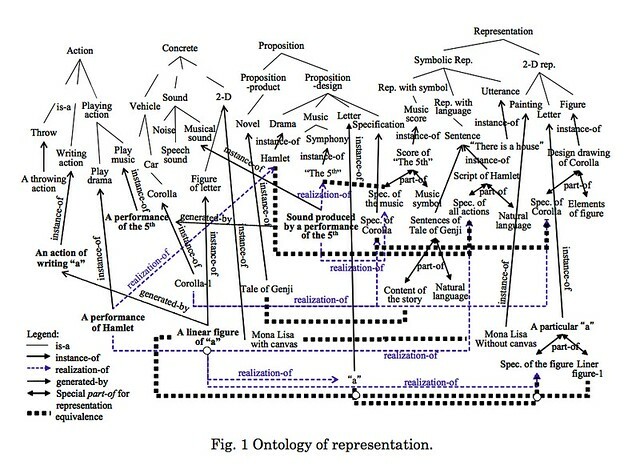 What exists as a subclass of representation are what have the form of representation as its intrinsic property, that is, sentence, musical score, painting, etc. The sentences of Tale of Genji are instance-of sentence. However, representation and form of representation are different. Concerning a novel, representation is “sentence” which is composed of its content(novel) and “natural language” which is the syntactic part of the sentence, as the form of representation. How are these theories different from each other? What are their pros and cons, where is it that they could be used more successfully? There’s work to be done here.. This entry was posted on Monday, March 5th, 2007 at 5:57 pm	and is filed under Information Architecture. Tags: dolce, frbr, KR, ontology. You can follow any responses to this entry through the RSS 2.0 feed. Both comments and pings are currently closed. Previous: Dear old paper, how could we do without you? When you say DOLCE, you do mean the Information Objects module (OIO) right? 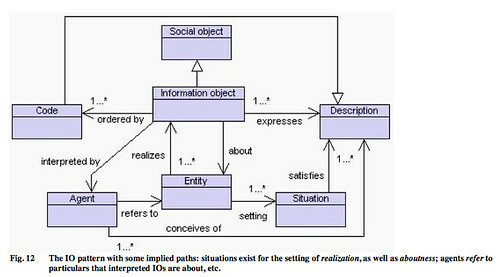 Did you also take a look at the OÂ² work, where they build a meta-ontology based on OIO? There’s a paper in the EON 2006, but also a longer TR on their own website.